Motorola announced the Android Wear running Moto 360, but was mum about a lot of details, including a launch date. The company also showed a bunch of photos of the smartwatch, on which it appears to be made of metal. Well, not so fast with the conclusions. The latest rumors have it that the phone will actually be made out of plastic. 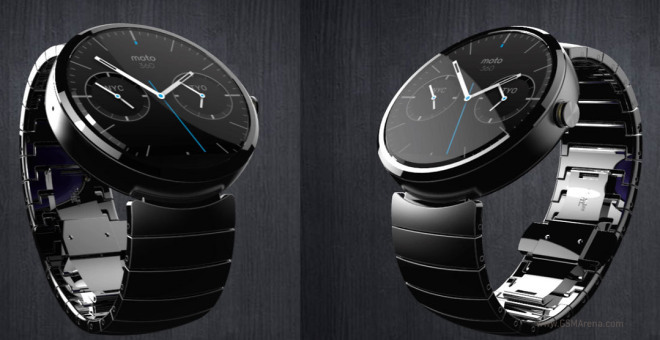 Additionally, because of the wireless charging feature, the Moto 360 is rumored to be 13.5mm thick. In comparison, it’s brethren the LG G Watch and Samsung Gear Live are 9.9mm and 8.9mm thick, respectively. Earlier, it was speculated that the Moto 360 is going to cost twice as much as the other Android Wear duo due to its sapphire display, wireless charging and OLED display. Its press photos give an impression that it’s going to be made out of metal. A plastic watch that looks like metal sounds like a bummer to me. Everyone is also wondering how large the watch actually is. The source of the rumors claims it’s rather large, measuring 48mm in diameter. As always, we advise you to take this information with a pinch of salt, as Motorola is going to have the final say what the exact specs of the Moto 360 are soon enough.